Sotrender is proud to present the 20th and 21st editions of Facebook Trends UK – the first report analyzing brand communication on Facebook in the UK. We've analysed reach, engagement, customer service, and content in integral industries. You can also find out who has the most fans or who is the most engaging. And we’ve updated the layout, added more categories, introduced new metrics and graphs. Read on to broaden your perspective on the social media landscape in the United Kingdom. The report contains data for 20 different industries present on Facebook in the UK. These include: Alcohols, Arts and entertainment, Athletes, Beer, Consumer electronics, Cosmetics, Digital media, Energy, Football clubs, Football players, Internet portals, Music, Musicians, People, Restaurants, Shoes, Spirits, Sports, Sweets, and TV Programmes. Kicking off our new-and-improved trends report is March 2017, and a lot has changed with some of the rankings. 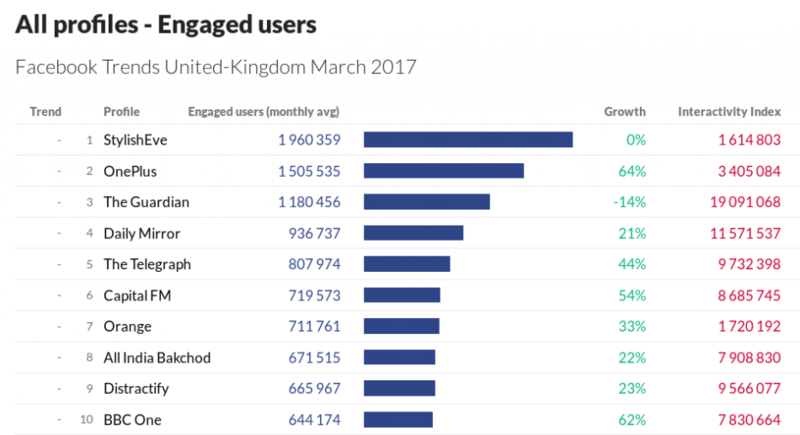 The most engaging profiles this March were StylishEve (1 960 359 engaged users), OnePlus (1 505 535 engaged users), and The Guardian (1 180 456 engaged users). Besides The Guardian, take note of how two relatively smaller brands were able to become the top engagers this month. If they can do it, so can you! The profiles with the largest amount of fans are Adele (65 959 312 fans), Disney (50 871 273 fans), and Instagram (43 492 109 fans). They might seem like the best profiles to follow, but not necessarily. Just because they’re big and popular doesn’t mean they’re engaging their audience well or offering top notch customer service. Remember, number of fans isn’t everything in social media! Your number of fans is important, but focus more on your engagement! The best customer service belongs to SportPesa Care (7 345 reactions), Virgin Media (2 785 reactions), and Tesco (2 433 reactions). SportPesa Care responded to a 87% percent of user posts, which might seem like a lot at first. But look at the rest of the ranking. A lot of profiles are just as reactive! As we’ve mentioned before, social media is an excellent place to offer customer service, especially on Facebook or Twitter. Keep it mind when planning your social media strategy. Do you use your Page for customer service? Try it out! This April, there were a few profiles additions to Facebook Trends, but there were no changes around the top rankings for the month. In the number of fans ranking, Adele is still number one (65 937 336 fans). Next position is taken by BBC News which had 2% growth comparing to previous month. Adele still has the biggest audience on Facebook. The best post this month was made by Bored Panda with a video showing a unique method of painting, which got tons of attention from their community. Being a brand that prides itself in sharing unique and interesting content, Bored Panda always gets a lot of engagement. You might want to take some notes. The second best post was made by Channel 4 News. Channel 4’s posts was a video post about the ‘algorithm’ for happiness as explained by Mo Gawdat, offering an interesting and easily applicable way to work towards happiness. In fact, if you look at the rest of the best posts ranking, you’ll see that all the most successful posts are video posts. Video is the way of the future for social media, so if you want to keep up with the competition, you better start making some videos. All video posts. A pattern you’ll want to take note of! And that’s our summary for Facebook Trends UK for March and April. With all the new changes, they’ve only gotten more informative and encompassing.